Former BU All-American and Hobey Baker Award winner Jack Eichel, beginning his fourth NHL season, has been named captain of the Sabres. 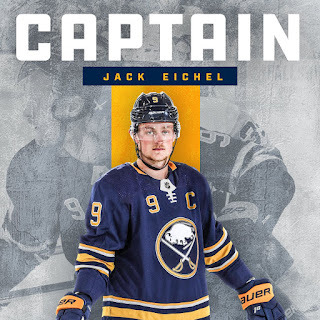 Eichel becomes the sixth Terrier to wear a C in the NHL, joining Tony Amonte (Chicago), Chris Drury (Buffalo and NYR) Shawn McEachern (Atlanta) Rick Meagher (St. Louis) and Keith Tkachuk (Winnipeg and Arizona). Shifted from wing to center during training camp, Greenway has nailed down the #3 center slot on the Minnesota depth chart. He’ll have Charlie at right wing on his line. 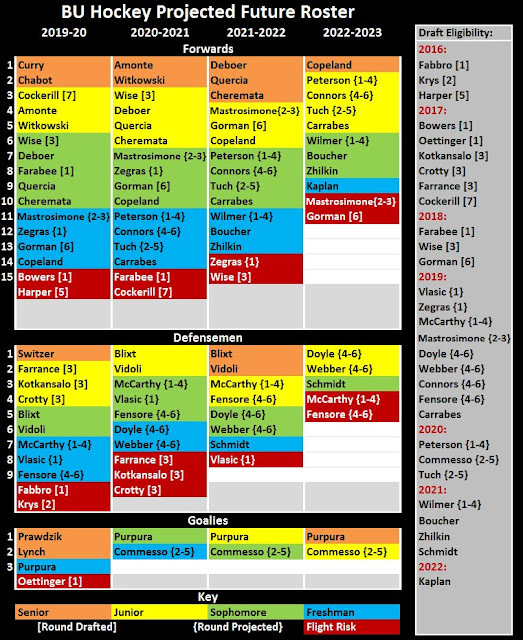 With Torrey Krug sidelined, Grzelcyk gets the opportunity to quarterback the Bruins’ top power play unit. Bourque is back for another AHL season, joining his brother with the Bridgeport Sound Tigers. Bourque, who played for the US Olympic team last winter, has been an AHL MVP and won two league scoring titles. 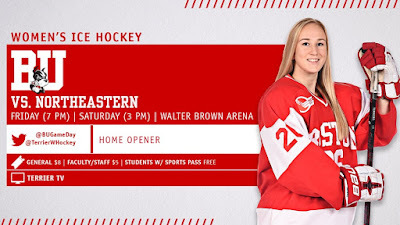 Terriers open the season with a pair of games against Hockey East rival Northeastern at Walter Brown Arena Friday and Saturday. BU’s top returning scorers are sophomore forward Jesse Compher and junior defenseman Abby Cook with 26 points each. Redshirt junior Sammy Davis returns after missing last season with an injury. Sophomore goalie Corinne Schroeder had a 12-8-4 record and a 2.51 GAA last season.